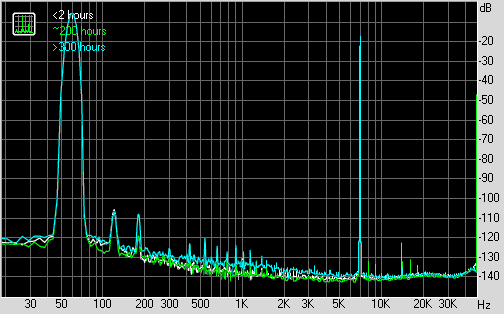 MEASUREMENTS: Another Look - Audioengine D3 clipping at 100% volume. The ability to interact with you guys over the last year or so running this blog has been vastly educational for me! Whether data gathering with the MP3 test last year or comments and suggestions with each post... In general I do try to keep up with comments if I can but after 80+ posts now, I apologize if there are some comments I've missed along the way. The post today is thanks to the keen eye of "Solderdude Frans" and his comments & suggestions to the previous post on the Audioengine D3. As per Addendum 2 in that post, indeed there is indication that a 0dBFS signal is clipping with the D3. I had missed it due to the fact that I was looking at the square waveform without considering the possibility of clipping contributing to the shape observed. Also while calibrating for the RightMark tests, RightMark and E-MU were flashing red for clipping and I thought it was that the amplitude was too high for the E-MU 0404USB rather than considering the possibility that the clipping was actually from the D3 output itself. Yup, the peaks are being clipped! As expected, there's a deterioration to the measured THD and IMD results going from 92% to 100% with clipping - still low using the RightMark methodology but more than 10-fold worsening with the clipping in place. Interesting... Like the first sample AudioQuest Dragonfly reported in Stereophile awhile back, it looks like one needs to back off the Audioengine D3's volume setting a bit in order to avoid clipping. In the case of my sample, pulling down the Windows volume control to 92% did the trick. Well, this fact obviously blemishes my impression of this little USB DAC as an accurate audio device. In practice, it's unlikely I will push the volumes to 100% but I wonder if this was by design. I find it hard to believe that the engineers did not check the clipping characteristics. Rather, my suspicion is that the engineers felt it was OK to allow the signal to clip a bit to increase the perceived amplification level. In a noisy environment, the extra amount of amplification of low level signal at the expense of distortion might be a reasonable trade-off that may not be too noticeable (possibly no problem at all if the music is soft and rarely hits 0dBFS) - of course, this would not be a "high fidelity" practice. Seems like there are some ruffled feathers around the recent "Geek Out vs. others" measurements published by Light Harmonic. Good to see that the Geek Out is being designed with good measurements in mind; encouraging. I can see how other manufacturers can be a bit unhappy about all this... Although it's probably wise to have a 3rd party perform the tests rather than a direct LH release, I suppose if it gets the manufacturers thinking about better engineering and competition in this regard, that's a good thing. Curious that there was no frequency response measurement. 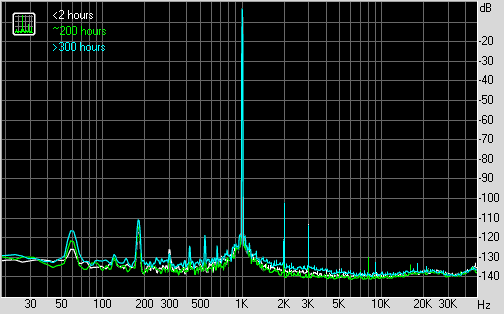 I wonder if at 44kHz, the Geek Out does measure like a NOS DAC with some early roll-off in the high frequencies. Ho! Larry somehow believes that "It's proven wrong to assume people could hear only below 20KHz" (see the comment section of that article). Ok. I suppose Ashihara's paper from 2006 could be used to argue this. But we're talking SPLs around 80 dB at 20kHz for most subjects as the threshold of hearing pure tones and there's quite a significant jump between 18 to 20kHz. Threshold for hearing pure tones isn't exactly evidence that this is beneficial for real music! Furthermore, if you look at the test subjects, they're aged 18 to 33 and the majority of these are young women! Good that hi-res can satisfy the golden-eared audiophile lady in our midst... Unfortunately it's not going to do much for the old boys I suspect ;-). MEASUREMENTS: Audioengine D3 USB DAC / Headphone Amp Reviewed. 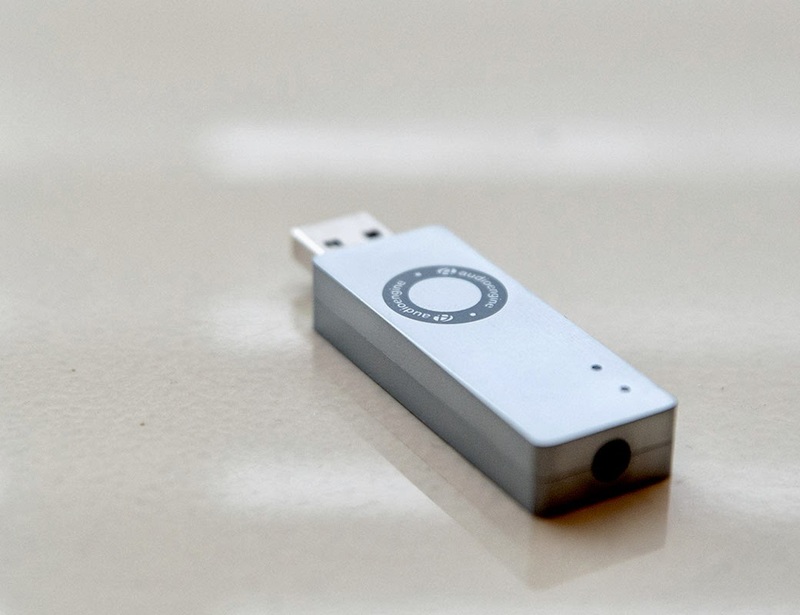 In the last couple of years, we have seen a proliferation of small sized USB DACs. Devices small enough for laptop-sized portability aimed at the headphone user who wants a bit more power to drive better 'cans' and provide improved sonics than what's available through the laptop's phono jack. I guess it must have begun with the AudioQuest Dragonfly back in 2012. Currently in the 2nd incarnation as version 1.2. 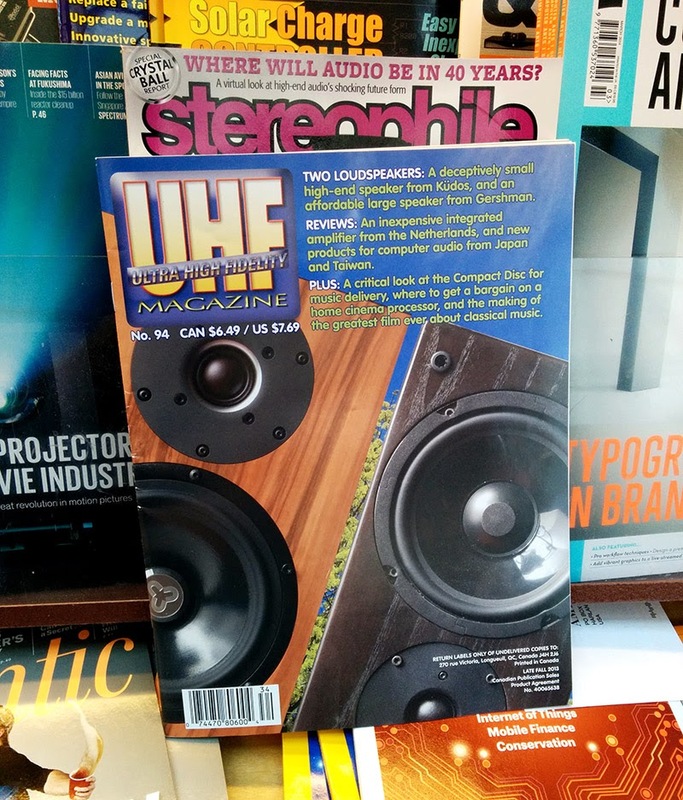 Version 1.0 got quite a positive review in Stereophile among other magazines which has helped propel this class of device into audiophile acceptability (if not some mainstream approval?). With the Kickstarter success of the Geek (Out) last year, these devices continued to gather press. To create a device like this can be difficult given the dependence on the USB port for power. I've certainly experienced first hand the noise pollution from plugging my TEAC DAC into the computer USB port and this being picked up by my Emotiva XSP-1 preamp's analogue passthrough. That was why I bought the USB-to-ethernet cable extender to provide some noise isolation that thankfully worked. So, a few weeks ago as I was perusing the local computer store, I ran into a sale on the Audioengine D3 USB DAC. I figure, what the heck - at less than $180CAD, it'll give me something to play with and if it sounds good, maybe it'll accompany me on overseas trips with a good pair of headphones. To save space, individual binary digits are not stored. The length of a pit corresponds to the number of "one" samples before a "zero" is encountered. The length of a pit or land is of course an analog value, and for that reason the CD can be said to be an analog disc, just like an LP. Wow... Ponderous man... So a CD is a material thing. All material properties have variability - the length of a "land", the depth of a "pit", the transition between "lands" and "pits". So what? As long as it's within the margin of error within specification, a one is a one and a zero is a zero. No problem. It's not like the length of a pit is going to end up with any other interpretation than either 1 or 0 by the decoding circuitry. It's binary; there is no 0.5. It's digital. The author even talks about the use of Reed-Solomon coding for error correction and mentions interpolation when errors are detected. So data DVDs are "pure digital" and (audio) CDs are not? Does the author not know that "lands" and "pits" also underlie the physical structure of a DVD as well (higher track density of course)? I assume that the author would consider CD-ROM "pure digital" since it too contains data (as if digital audio is not data) and DVD evolved from it? Yellow Book and all that followed, leading to the DVD-Books and modern Blu-Ray Disc formats have a much more complicated structure which contains an actual file system; typically ISO9660 or UDF. This adds the extra layer of complexity and features like file names, permissions, directories, opportunity to append/delete/move for rewritable media, etc... Error correction is also much better at the expense of some storage space. I can only assume the author of that article somehow associates these characteristics with "pure digital". How strange... In 2014, a "technology" magazine would even declare that the Audio CD is somehow not a "pure" or "true" digital medium. I guess the editors must have missed this! Hopefully the readership can send a few "Letters to the Editor" to set this straight. Perhaps the author is taking to heart the title "The Analogue Compact Disc" from Robert Harley writing for Stereophile a little too strongly! That article was from 1994 and speculated about jitter rather than questioning the digital-ness of an audio CD. Even in that article, I'm concerned about this declaration: "It's becoming incontrovertible that CDs containing the same 1s and 0s produce varying levels of sound quality." Incontrovertible. Really? Hey guys, I "recalled" an article I posted this AM on why DR increases with vinyl rips based on RIAA EQ processing. 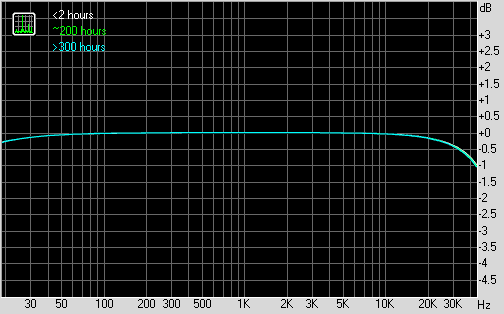 The reason being I think small changes like +2-4dB of DR in compressed recordings using the RIAA EQ are very much based on the resolution of the emphasis and de-emphasis filters. JR_Audio made a comment on this and I had a look at the accuracy of the RIAA curves I made. 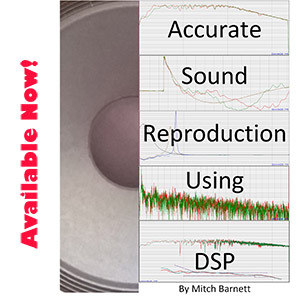 Indeed, mathematically essentially perfect curves <+/-0.1dB add very little DR extension, maybe only 1dB whereas "looser" accuracy like +/-0.5dB through the audio band could give +2dB with the DR Meter with some idiosyncrasies depending on the song and which frequencies the RIAA inaccuracies lie. In real life, things are more complicated. Even without a significantly better source master, for the final vinyl mix, small changes can be done to the signal such as mixing all the bass frequencies up to 100Hz into mono or taming of the high notes along with the RIAA curve. The results might be more pleasing or euphonic (see this article on mixing for vinyl and how much work potentially needs to be done). On playback, other physical factors are also involved such as the tracking force of the cartridge/tonearm or idiosyncrasies of the cartridge and accuracy of the phono pre-amp. 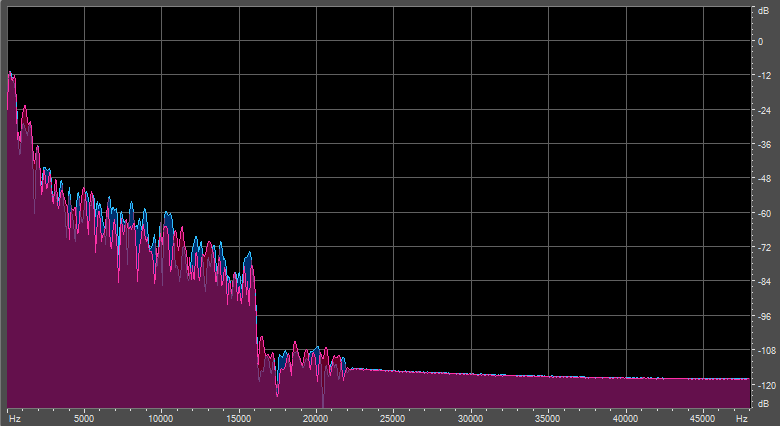 Also, post-processing such as noise/click/pop reduction would add another variable for the results from "needle drops". If you look at a number of different vinyl rips, it's quite common to see slight DR variation depending on the equipment and technique used (typically another DR +/-1dB is not uncommon). Indeed, I noticed this afternoon playing with Audition just how easy it was to artificially inflate DR values! For example, mixing all low frequencies <100Hz as mono. I played around with this using Lorde's Royals song using a lowpass filter to isolate those low frequencies and then mix them back into the highpassed upper portions as mono... Even though the sound wasn't significantly different when volume matched, it was not difficult at all to get a DR8 original 24/48 HDTracks version up to DR13. As I noted in the original article, I believe this is just the result of removing peak limits and clipped portions, allowing the calculations to extend these portions with the DSP operations. Given the effect I saw, ultimately I think there's no conclusion one can draw between what's measured on a vinyl rip and knowledge/proof of whether truly new masters are being used unless specifically told about it! I guess after trying this for awhile, I realized just how sensitive the DR Meter can be. Ultimately it is useful as a tool to explore the average dynamic range of albums and especially pick out very poor masters with strong peak limiting. It's also useful to determine if 2 pressings are exactly the same. Anyhow... I might review this later if anything clears up for me in the days ahead; just really hard to post something unless good conclusions can be reached. One example of a vinyl remaster that's truly the "definitive edition" is Stadium Arcadium by the Red Hot Chili Peppers. As usual for Vlado Meller the CD's mastering engineer, the dynamic range compressor was stuck at "11" resulting in a sick album with an average DR5. The vinyl release had proper mastering treatment by Steve Hoffman resulting in a DR12 average. That's the kind of difference one wants to see between CD and vinyl to be sure of truly better vinyl source material. MEASUREMENTS: Does "Burn-In" / "Break-In" Happen for Audio DACs? Jazz at Lincoln Center Orchestra with Wynton Marsalis did a great job last Saturday night at the Chan Center here in Vancouver. A friend once told me "Jazz should be seen as much as heard!" I think he's right. Always great to watch artistry in the making and correlate the sounds heard with how it was done. It's also a good opportunity to check out the acoustics in a moderate sized venue with minimal amplification of a 15-piece jazz band. Puts into perspective the dynamics and detail of what one hears in the home system. As of this writing in early March, I've had this DAC for 10+ months. I'll very conservatively estimate that I've put on >300 hours of actual audio through it (not just time turned on). I made sure when I first bought it that I would measure it within the first couple hours of use so that one day (now), I can go back and do a comparison to see if any kind of significant "break-in" can be demonstrated. I figure there's no point measuring at lower resolution than 24/96 for something like this. You will note that the stereo crosstalk has a 4dB spread from highest to lowest (remember, we're talking down at -90dB here). The reason is simple. These are different RCA cables. At "<2 hours" and "~200 hours", I was using a 3' length of RCA cable whereas the ">300 hours" measurement was done with a 6' cable due to the inconvenience of a short cable in the current set-up. As I showed in the RCA analogue interconnect test, length of cable makes a significant difference with stereo crosstalk measurements (shorter is better) for the standard zip-cord type I'm using. This could also be the reason for the slightly lower noise floor especially notable on the THD and IMD graphs above (again, remember we're looking at the -120dB level here!). Otherwise, I see no evidence here of a significant change that would be audible. 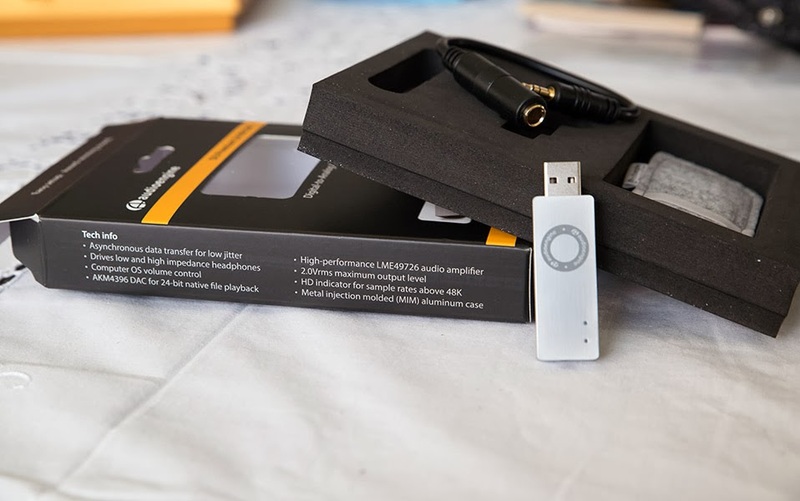 These measurements suggest that there really is no such thing as audible "break-in" for purely electronic devices like DACs within a reasonable period of time. People hearing the "effect" on a regular basis are more likely to be changing their psychological expectations over time than the device actually changing sonic character. I guess change could be happening within the first 2 hours but one almost never hear people claim this; for the most part, people recommend something like 100+ hours. Logically, if anything, electronic devices deteriorate in time as components (like capacitors) get old and connectors oxidize. Sonic change for mechanical devices like speakers would make much more sense... InnerFidelity had an article about change in the sound of the AKG Q701 headphones over time (65 hours). The measured differences in those graphs are much more than what I'm demonstrating here. In summary... I wouldn't be worried about "burn-in" with purely electronic devices. If you like the sound at the start, great. If not, maybe give it some time for your ears/brain to adjust and see if you like it then. Sure, keep the device on, blast some hard rock or play a burn-in CD if you feel this helps. If there's no difference with complex electronic devices like the DAC, it'd be quite unreasonable to expect to hear a difference with totally passive "components" (eg. wire/cable burn-in). I find it suspicious that some companies like this one would claim cables needing 400-500 hours (17+ days straight!) to break-in! The more cynical side of me wonders if there is a benefit for companies to do this because it gives them a "grace period" to tell customers to wait. Furthermore the message itself promotes expectation bias towards improvement in time... "No worries! Give it some time to really sound it's best, Mr. Audiophile!" Subjectively, I cannot say I've ever thought I could hear burn-in. The TEAC sounded good to me from the start and I'd be foolish to claim with certainty any difference at this point almost a year down the road unless of course there were some kind of night-and-day change (which there obviously hasn't been). Perhaps the standard measurements I present here are unable to capture whatever change there's supposed to be. As usual, I propose to those who are certain that burn-in happens to present any links to information or data to support this belief. Sonny Rollins Way Out West - just got reacquainted with this old 1957 jazz recording. A fantastic vintage recording from the golden age of analogue done with the tube Ampex 350 tape recorder. This was chosen as the first CD release by Mobile Fidelity back in the mid-1980's (I think 1984). There have been many reissues of this over the years and I think the highest resolution one would be the Analogue Productions SACD from 2002. FOLLOW-UP: Anomalies in Beck's "Morning Phase" (HDTracks 24/96). 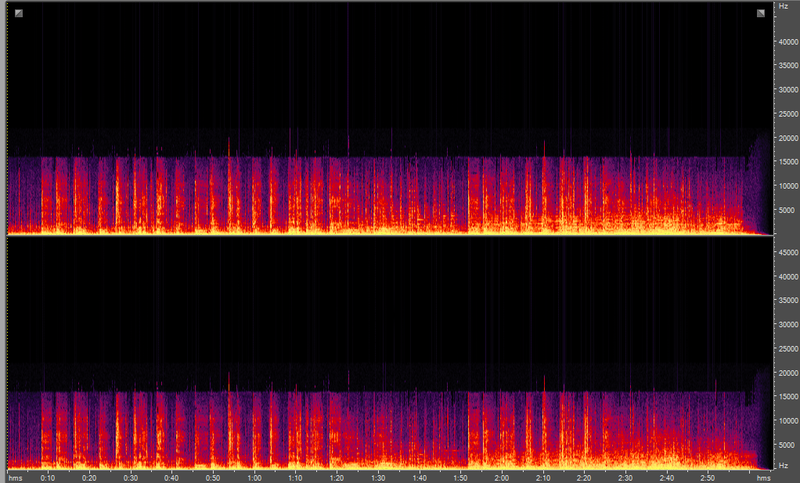 Track 4 - "Say Goodbye"
Looks like there's almost nothing after 22kHz but low level noise. 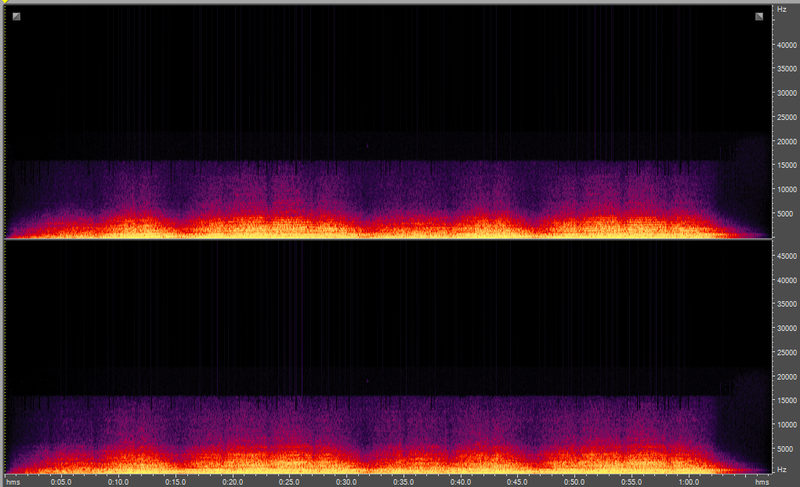 Essentially a 44kHz "upsample" for many of the notes. Actually, my friend says a number of tracks he looked at is like this; for example tracks 3 and 5 also (I don't think he checked every track). Since this is a multi-tracked recording with synthesizers and various studio effects, this is actually not surprising - many synth/pop/rock albums are like this. 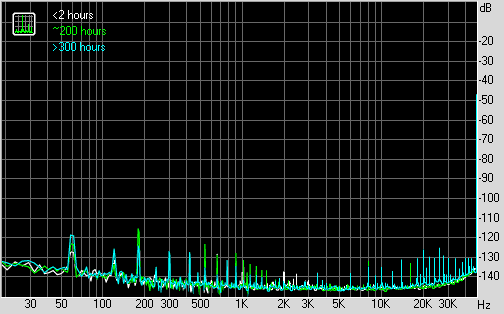 Many samplers and DSPs operate in the 44/48kHz domain so what's laid down is "limited" and there's just no 'genuine' 96kHz sound available. Track 11 - "Turn Away"
My word... It looks like tracks 10 & 11 are sourced from some kind of lossy original! 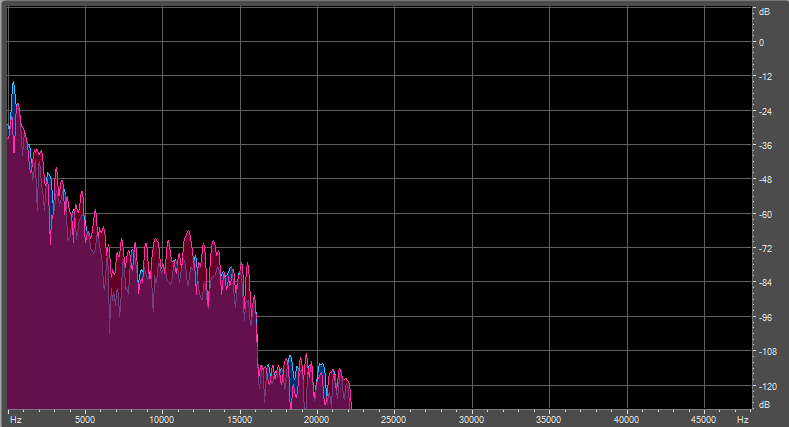 Notice the characteristic low-pass from about 16kHz! Might as well be the output from LAME 320kbps (on second thought, 320kbps usually retains up to a full 20kHz with the psychoacoustic model so we're likely looking at 192-256kbps). Now I'm definitely going to be purchasing the CD rather than any high-resolution download (assuming I want it... Haven't listened to any samples yet). I don't know if folks have checked the CD or if the Qobuz version is any better. Seriously, HDTracks... Do you guys ever look at these files for quality control purposes before declaring the album fit for high-resolution and charging folks $18USD? I know you claim to just sell what the label gives you, but isn't it a bit disingenuous to be calling much of this album "Audiophile 96kHz/24bit"? Given the publicity Beck's album received a week ago and now the revelation of the quality issue, I do hope this serves as a meaningful wake-up call to HDTracks specifically and the audiophile download community as a whole. If HDTracks sticks its head in the sand on this, it would be telling that their commitment is clearly not to their customers and they certainly cannot maintain any quality control to assure their product is "HD" in any sense of the acronym. 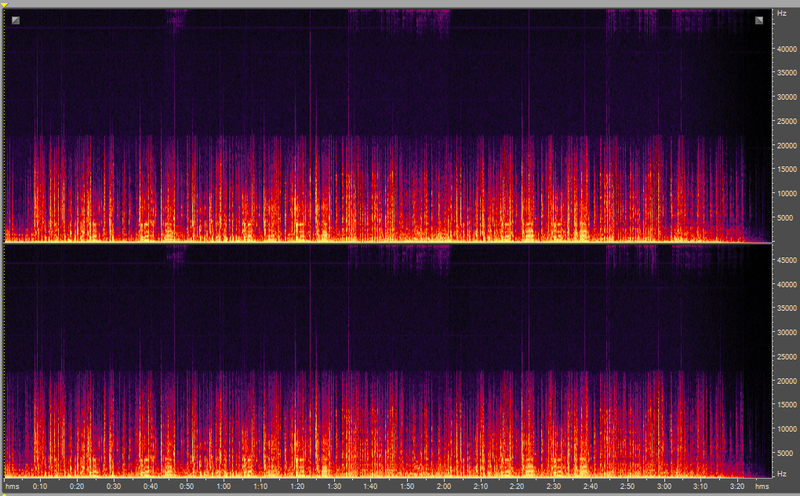 Upsampled 44/48kHz is bad enough, but lossy sold as "HD" is just ludicrous! Thankfully, I did not buy this album from HDTracks... I suppose if I did, I'd be asking for a refund ASAP or at least demanding a higher quality download. 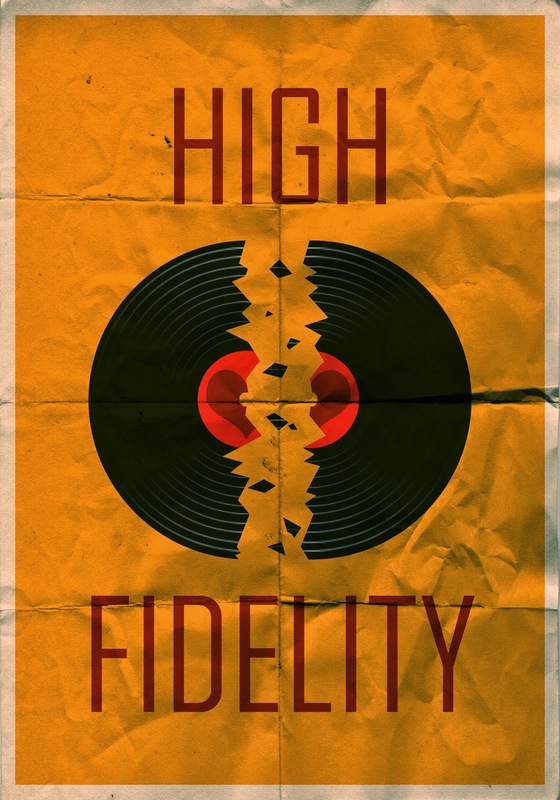 I guess an LP can still be considered "high fidelity" by some in 2014... But doubtful it should ever be called "high-resolution"! Like DSD / SACD, high-resolution PCM (24-bit, 88kHz+) in the form of DVD-V (up to 24/96) and DVD-A has been widely available for more than 10 years already ("rebadged" recently as HRA for "High Resolution Audio"). DVD-V's with 24/96 audio tracks could be easily ripped back in the early 2000's, and by early 2007, the DVD-A copy protection was overcome allowing easy DVD-A ripping and evaluation of the sonic data up to 24/192 2.0 and 24/96 5.1.